To connect your Xbox One Kinect Sensor to a new Xbox One S console, you must use an Xbox Kinect Adapter. For more information, see How to use an Xbox One Kinect Sensor with an Xbox One S console. 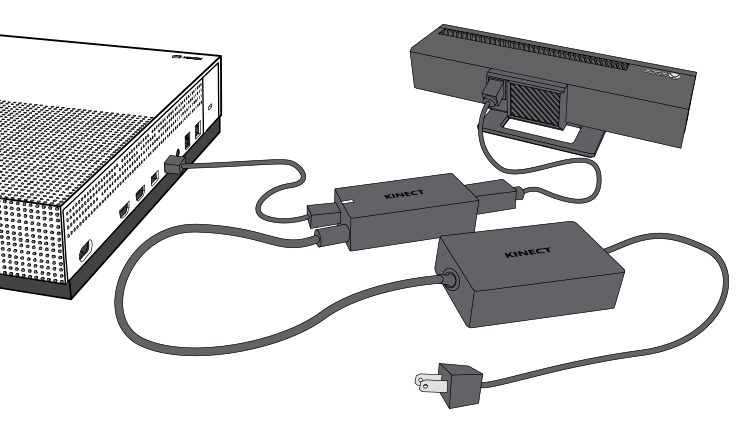 To connect your Kinect sensor to an original Xbox One console, simply plug the Kinect sensor cable into the back of the Xbox One console, as shown in the following illustration. Note The cable for the Kinect sensor is 3 meters (9 feet) long. This is currently the longest cable available, so make sure that your Xbox One and your Kinect sensor are close enough to allow the sensor to be plugged in. Would you like to contact Support regarding the "Connect your Kinect sensor to your Xbox One S or original Xbox One console" issue you were reading about or a different issue?